There are two ways to let customers who have ordered a limited-edition version of Forza 4 know that you can't deliver it. One is to apologize and try to keep as much of their money as possible as Best Buy did. The other is to make them happy with a free copy of the game, like Walmart is doing. Thank you for your recent order (xxxxx) from Walmart.com. Unfortunately, due to a supply issue, Walmart.com will not be carrying the Forza Motorsport 4 Limited Collector's Edition (Xbox 360) and therefore we will remove it from your order and you will not be charged. Please see additional refund information below. We apologize for the inconvenience. 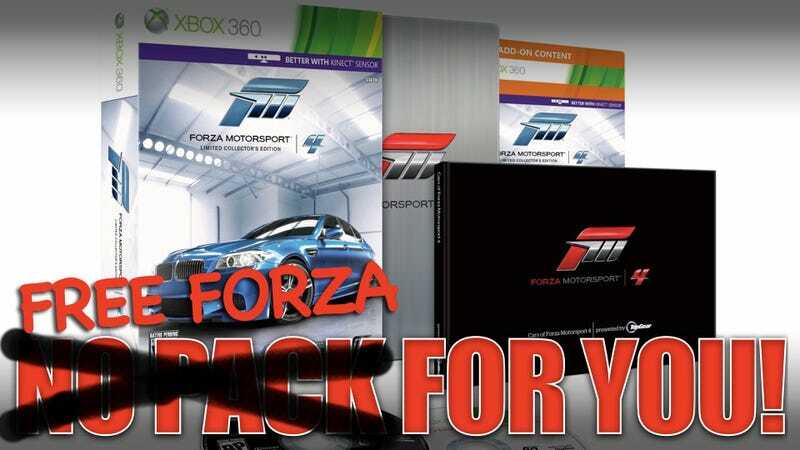 To thank you for shopping at Walmart.com, we'll be sending you the Forza Motorsport 4 (Xbox 360) base edition at no charge. We will also be providing you with a code (located on the item packaging) to download a free exclusive Mini Cooper Downloadable in game car. While one can wonder what's making all these Forza 4 editions so limited, giving people a sought-after game worth $60 for free buys a lot of goodwill. Hey Best Buy, does it hurt knowing you've just been served by Wally World? Hat tip to Eric and Richard! FULL DISCLOSURE: Jalopnik had an editorial tie-up with Turn 10 Studios on Forza Motorsport 3, this game's predecessor, on two DLC packs for the game. We are working on a similar tie-up on Forza Motorsport 4. Although no money has exchanged hands in this relationship, because it might be something you feel could affect our judgment and clarity in covering this game, we felt the transparency was important.